With Chipotle on the way, should Magazine Street limit the influx of chain stores? The imminent arrival of fast-growing Chipotle chain burrito restaurant on Magazine Street — plunging directly into competition with beloved local Latin restaurants — has local residents beginning to explore legislation that might limit the influx of national brands on the uniquely Uptown New Orleans thoroughfare. Julie Simpson, president of the Coliseum Square Association, told association members Monday night that she had recently participated in a meeting with the StayLocal nonprofit and representatives of other neighborhood groups, such as the Garden District Association. The topic, Simpson said, was the possibility of some sort of land-use regulation specifically for Magazine Street that would limit the growth of chain businesses. Chipotle, Simpson said, is not exactly the problem, since it seems to be on the way already — and actually is taking over the space from a previous chain retail store, RadioShack. But its arrival signals continued development interest from national brands on Magazine Street, Simpson said, and thus prompts the need for possible action by the city. “It’s sort of something that represents what is maybe coming down the chute,” Simpson said. Other cities, such as San Francisco, have already increased regulation on “formula retail” businesses by limiting the number of them that can open in a certain area. So Chipotle could possibly open, but other chains would have to locate further away. 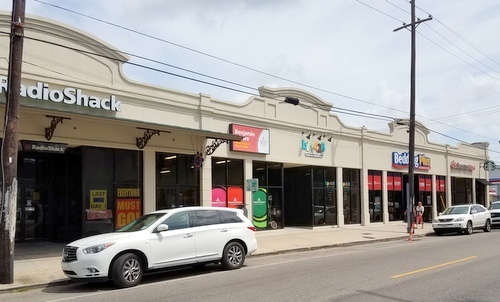 While protecting the culture of Magazine Street often draws the most attention, chain businesses represent a much larger economic harm to the city, said Meredith Cherney of StayLocal in an interview Tuesday morning. Chain businesses not only send their profits out of state, but they are also far less likely to hire other local businesses for the services they require, such as accounting. The owners of independent businesses, by contrast, not only spend their profits in New Orleans, but they also use other New Orleans businesses for those services, Cherney said — creating an estimated three times the local economic impact of a chain business. Local business owners also worry about the effect of the influx of chains on Magazine Street rents. A 2014 study by StayLocal found that three-fourths of local business owners agreed that chain stores threatened the street’s culture, causing them to worry whether they will be able to afford rising rents. Whether chains have a direct impact on rents remains under study, Cherney said, but anecdotal accounts abound in the Magazine Street community about landlords preferring chain tenants over local businesses. The idea of limiting chains drew a wide variety of responses from the association members. Catherine Love, the association’s new vice president and a candidate for City Council, said she would prefer helping local businesses coordinate their efforts to compete with national brands, rather than limiting their arrival. She described the way that small dairy farmers pool their efforts to stay in business when large industrial dairy operations arrive. Other candidates for the District B seat also discussed their views on the question in a forum last week hosted by the Bouligny Improvement Association. Most praised the uniqueness of the city’s businesses — such as Seth Bloom, who said, “I don’t want to live in a strip mall paradise” — but did not specify new legislation they would support. Others said that they would want to ensure any legislation did not inadvertently harm local businesses that have been successful in opening multiple locations, such as the Ruby Slipper restaurant or PJ’s Coffee. Joel Dondis, who operates Il Mercato, Sucre, La Petite Grocery and Grand Isle, said that any new legislation might need to treat different industries differently. While the arrival of new chain pharmacies is frequently bemoaned by residents, locally-owned pharmacies are no longer as prevalent, and grabbing something from the Walgreens or CVS is a part of most people’s lives. A vibrant local restaurant scene, however, is vital to what visitors and locals alike expect from New Orleans. “Maintaining that experience on Magazine Street is vital to the economy of New Orleans,” Dondis said. The association did not take any formal action on the issue Monday night, but suggested forming a committee to continue pursuing the idea with StayLocal and other neighborhood groups. The title of this article is a question, but everyone quoted has the exact same anti-chain store opinion. This reminds me of the coverage of the monuments. We have lots and lots of wonderful local restaurants on Magazine, and I can’t imagine wanting to go to a Chipotle’s in my neighborhood for lunch or dinner. Seriously. I’d go anywhere before eating there. True New Orleanians do NOT want chain restaurants. Allowing food chains on Magazine is an error that zoning, the Council, and neighborhood associations should work as a team to prevent. That said, chains go under rather quickly. National chains don’t fly in a city with taste, especially when a PoBoy can be had at the same price point. Chipotle will close in a year. Just like Chicos and Jimmy Johns, before them. Uptown New Orleanians wear cotton, not stretch rayon, and we do not eat processed frozen foods.